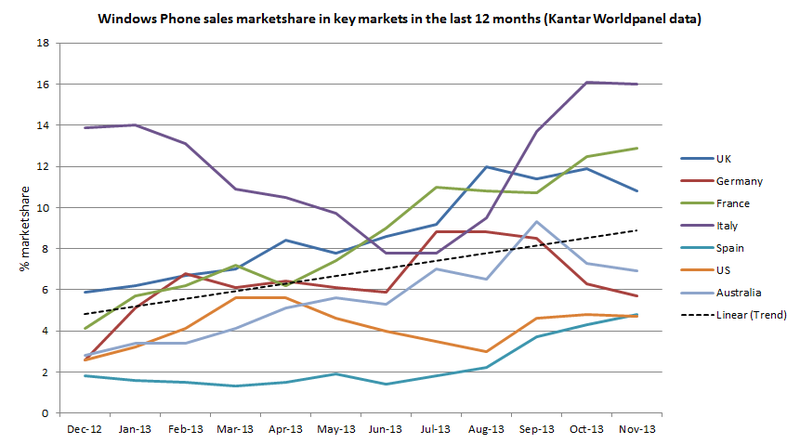 The latest set of Kantar Worldpanel data, released today, shows that Windows Phone is holding steady on its recent gains in market share. The figures for the 3 months ending November 2013 indicate Microsoft's mobile platform has a 10% sales share in Western Europe and just under 5% in the US. Windows Phone passed the 10% sales share figure in the EU5 (Germany, UK, France, Italy, Spain) for the first time last month. The latest EU5 figures show a small fall from 10.2% to 10.0%, but that should be set against the release of the new iPhones and several high profile Android launches. Italy was once again the leading market (16%), followed by France (12.9%), the UK (10.8%), Germany (5.7%) and Spain (4.8%). While Spain does remain the weakest EU5 market for Windows Phone, there is some evidence that sales are improving, with sales share significantly up from the 1.4% figure from June 2013. Assuming a 24 month smartphone ownership cycle, Kantar's data suggests Windows Phone's active install base share in the UK is currently around 5%, but assuming a 12 month smartphone ownership cycle this figure is 8.4%. The active install base figure is important because it is frequently used as the basis of investment decision on what smartphone platforms to target (i.e. a company may choose to create an app for a platform only when its installed base passes a certain point). The Kantar figures for the US and China show Windows Phone marketshare for both countries remains below 5%. However, Microsoft and its partners will find some cause for optimism given that both markets have shown slow, but steady, growth in the last few months. Windows Phone has increased its sale share from 2.1% to 2.7% and from 3% to 4.7% in the last four months in China and the US respectively. Looking at performance over the past 12 months makes it obvious that 2013 has been a good year for Windows Phone. Sales share has doubled in both Europe and the US, albeit from a relatively low base. Nonetheless, the figures do give the platform a good base to build on in 2014. Last year was also notable for being the year in which Windows Phone overtook BlackBerry for third spot in the smartphone market, cementing its position as the the "third ecosystem" in mobile. In the overall market context, Windows Phone sales share remains relatively modest, very much in third place behind Android and iOS. The challenge for Microsoft and its partners in 2014 is to maintain and extend the momentum that has been built by low cost devices like the Nokia Lumia 520 and 625, while continuing to chip away at the high end. Sunnebo comments: "You don’t have to conquer China and the US to win in the smartphone market, but you do need success in one of them. At the moment there are few signs of progress in either country for Windows Phone and momentum needs to be made soon before OS loyalty severely limits the available market." "China is likely to be the easier and more rewarding target for Windows. After all, Nokia has a huge existing presence in the market, retains strong customer preference and can sell handsets at the right price to capture the huge numbers of people with relatively modest budgets. However, with Microsoft soon running the show it’s hard to imagine a change in strategic direction away from the US." 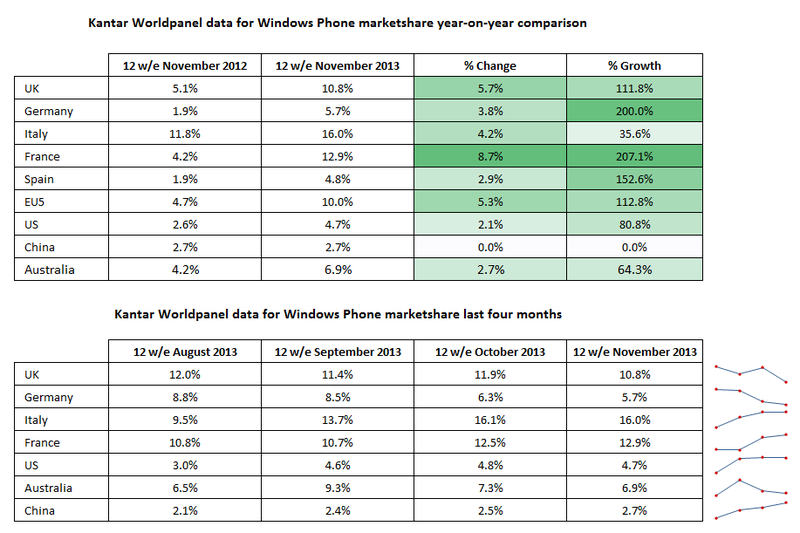 The overall context for Windows Phone is illustrated in the charts below, which show Kantar Worldpanel data from the last two years for the EU5 and the USA. There are clear differences between the two markets. The US is seemingly more of a duopoly, split between iOS and Android. In Europe, Android is dominant, but the market structure is more of a three-way race, with the difference between iOS and Windows Phone being smaller than many might assume.